Physio aims to get you laughing, not leaking! Elaine Miller is a physiotherapist, comedian, mother of three giant headed children and a recovered incontinent. She did the obvious thing, combined all of those and wrote a stand up show about pelvic floors, “Gusset Grippers”. A shocking 1 in 3 women and 1 in 9 men wet themselves. Leaking is common, but never normal, and most cases of stress incontinence can be cured. “There is a perception that it’s an inevitable consequence of ageing or parenthood, but, that’s not true. There is no need to put up with it.” says Elaine. The audience leaves Gusset Grippers knowing what a pelvic floor is, what it does, why having a good one is smashing, and where to take theirs if it is a bit broken. Elaine hopes to break down the taboos which surround incontinence and sexual dysfunctions. A healthy pelvic floor improves orgasms for both men and women, so, it’s almost fair to say that this show does that too. It is suitable for all orientations and genders. Gusset Grippers is evidence based and counts as Continuing Professional Development for Healthcare Professionals. Certificates, references and reflective questions are provided. This show aims to spread the message that you don’t need to put up with the leaking, sexual dysfunctions, pelvic pain or vaginal prolapse that affect millions of people. Elaine is a sought-after speaker for world wide professional conferences where she presents on pelvic health and the use of humour as a health promotion tool. 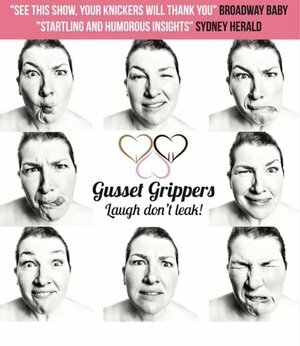 Featured on This Morning, Call Kaye, The Guardian and Mumsnet, Gusset Grippers has been performed in Australia, Canada, New Zealand and Ireland. Unusually, Elaine uses twitter as a training tool, “compliance is a problem, so, follow @gussiegrips, when I tweet, you twitch your twinkle”. Anecdotally, it seems to work! Gusset Grippers was on tour Autumn 2017. Check What's On for future dates.